One often-overlooked contributing factor to rising home prices in Canada is mortgage interest rates. Between 2000 and 2016, the prevailing mortgage interest rate declined from 7.0 percent o 2.7 percent. This decline resulted in a 52.9 percent increase in the mortgage borrowing power (maximum eligible mortgage size) of potential home buyers. 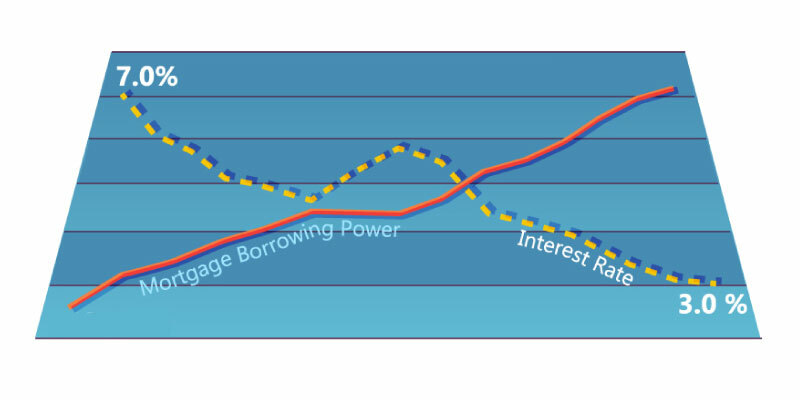 Based on average family incomes in 2000, falling interest rates resulted in increased mortgage borrowing power in the four main regions over the same period: Vancouver from $183,751 to $280,893; Calgary from $221,214 to $352,671; Toronto from $221,214 to $338,161; and Montreal from $171,692 to $262,459. Average family incomes also increased from 2000 to 2014. Specifically, average nominal before-tax family income for Canada as a whole increased 53.0 percent over this period with changes in the four metropolitan areas as follows: Vancouver incomes increased by 47.8 percent; Calgary by 76.8 percent; Toronto by 35.2 percent; and Montreal by 45.5 percent. Rising average family income coupled with decreasing interest rates resulted in a pronounced increase in the ability of potential home buyers to borrow. Specifically, the increase in nominal mortgage borrowing power for Canada as a whole was 126.1 percent. The four metropolitan areas ranged from a high of 161.2 percent in Calgary to a low of 99.7 percent in Toronto with both Vancouver and Montreal recording similar increases of 118.4 percent and 115.0 percent, respectively.